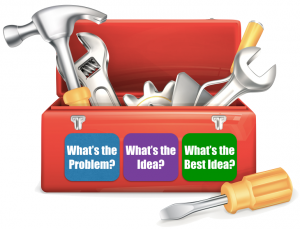 Once you’ve generated lots of ideas you need a way of identifying which ideas are the good ones. You also need to keep in mind how you would implement your new ideas and the effects of this could be. Sadly, for a variety of good reasons there is very little research assessing the tools used here. This may be because it is difficult to know beforehand what a ‘good’ solution would be to any problem. There are hints that using metrics to classify ideas into categories such as ‘winners’ and ‘losers’ may help identify the more creative ideas. However, this is one area we are now focusing on so if you have any ideas yourself please let us know.